How the Buy a Bear Program helped one young patient comfort another In fact, in addition to children, the bears have touched the lives of some of our most vulnerable patients – from the tiny newborns in the neonatal intensive care unit, to patients fighting cancer in our Chemotherapy Clinic, to the elderly suffering from dementia. Mick Cavanagh, 13, bought a bear for fellow patient Andrew Easun, 7. 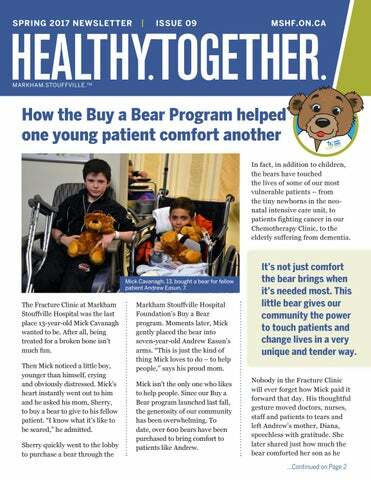 Markham Stouffville Hospital Foundation’s Buy a Bear program. Moments later, Mick gently placed the bear into seven-year-old Andrew Easun’s arms. “This is just the kind of thing Mick loves to do – to help people,” says his proud mom. Mick isn’t the only one who likes to help people. Since our Buy a Bear program launched last fall, the generosity of our community has been overwhelming. To date, over 600 bears have been purchased to bring comfort to patients like Andrew. Greetings from the Foundation CEO I love my job at the Markham Stouffville Hospital Foundation. Even after 10 years, it gives me such pleasure to come to work each day. You see, as the Foundation CEO, I often hear stories like MSH Foundation CEO the one we featured Suzette Strong on the cover of this newsletter – heart-warming, inspiring stories that remind me of the generosity of our community. And it all begins with you. Every story of recovery and hope has our generous supporters at its centre. What’s the secret to longevity? Is it unwavering commitment to community and generosity of heart? Russell Beare, life-long Markham resident and loyal Markham Stouffville Hospital supporter, might say so. At his recent 100th birthday celebration, Mr. Beare reflected on his involvement with MSH. Having contributed to the $5 million “building fund” campaign, Mr. Beare is Russell Beare, among Markham Stouffville life-long Markham resident Hospital’s founding donors. and loyal MSH supporter Today, he remains just as committed to the hospital. He proudly counts his role in its inception as one of his greatest accomplishments. And on the occasion he’s needed it, he’s received excellent care there. Joan Whittaker is passionate about her hospital. As a long-time supporter of Markham Stouffville Hospital (MSH), she believes saving lives and helping people heal is a wonderful gift. That’s why Joan has made the thoughtful decision to leave a gift in her will to continue supporting Joan Whittaker, the patient care she believes in. She wants to MSH Legacy Donor ensure MSH will continue providing excellent care, for her family and neighbours and everyone who needs it. Gifts from caring legacy donors like Joan are critical. Legacy gifts strengthen the long-term financial security of our patient care, ensuring that your friends and family continue to access world-class health care right here at home – today, tomorrow and for many years to come. We are eternally grateful to people like Joan for their foresight and generosity. May is Leave a Legacy month. We hope you too will consider helping sustain patient care at MSH by leaving a bequest in your will. 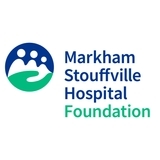 You can fulfill your charitable goals, take advantage of tax benefits, and support the important work of Markham Stouffville Hospital long into the future.